I'm starting to get more sophisticated about my biomass uses. While autumn leaves make a good mulch for perennials, they tend to blow around, so when I have my druthers, I've been using seedless weeds and composted wood chips there. Meanwhile, I'd like to channel the autumn leaves into the chicken coops, where they make the best possible addition to the deep bedding. The leaves are high enough in carbon that they counteract quite a lot of manure, and they're also fluffy enough that chickens can scratch through easily, mixing the coop-floor compost heap. The snag I'm hitting in my grand plan is storage. While I can rake leaves out of the woods at any time of the year, right now is when they're easy pickings. Before they've been run over and rained on too many times, it's child's play to rake the leaves off the bare parts of the driveway, then scoop them into the golf cart. In half an hour, I can come home with three heaping wheelbarrowsful. But where to put them? For deep bedding, it's best to store leaves somewhere dry, and they're so fluffy that they take up a lot of space. I'm starting out the easy way by filling both coops to the brim --- I may have to fork through the leaves if the tops get matted down, but otherwise I'll have happy chickens for at least a month or two with little work. I'd like to store enough to last me all year, though, since deep bedding starts to smell and breed flies in the summer if not refreshed frequently, and I'm slow to add more bedding if all I have on hand is subpar materials. I'm pondering closing in a little corncrib-like room in the barn and stuffing it full of leaves, but I feel like there's a simpler solution out there. Ideas? 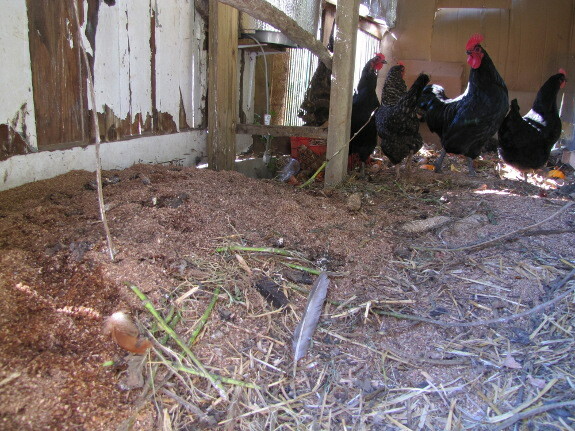 Our chicken waterer keeps the flock healthy while they're scratching through their bedding in search of worms. A piece of tall chicken wire in a circle can hold a bunch of leaves. You can put it next to the coop and throw a tarp over it. Daddy --- Good cheap and easy idea! Rein --- Interesting idea to top the pile with compost and dirt instead of plastic. Does that still keep them dry, or are you composting the leaves for garden application? Speaking of woodchips, do you have any thoughts on woodchips? I have so many sticks and I'd love to be able to use them as mulch. But they're not rotting. I throw them in the compost pile and then pull them back out of the finished compost. Is there a way to encourage them to rot? I looked at woodchippers and they seem to run in price from $200 - $9000. I'm not so much in the market for a $9000 woodchipper and I'm dubious about whether or not a $200 would be any good. But with all the sticks at hand, I feel stupid paying to for bags of wood chips. Instead, I've been piling up limbs like that in brush piles around my fruit trees, mashing them down a bit now and then and adding weeds on top. The method seems to be working well! Since I made that post, my weed piles seem to have taken care of greenery trying to push up through the brush pile. The other alternative is to flag down the folks who chip trees along the road and powerline. They'll often dump off a whole dump-truckload if you've got an accessible open spot. You'll want to let the chips age for at least a year (two is better) before using, but they're high quality and free! I've no extra storage space myself. it either goes on or in the ground. I,erm, repurpose my neighbors bags of leaves. Dump into a trash can, use weed whipper like a stick blender, dump out can where needed. Repeat. Very quick breakdown, no blowing all over the place etc. etc. I have to do a few sections of one bag from the neighbors trees, but for my tiny spot it is worth it. c, I'm all for stealing the neighbor's leaves. Once it's on the curb as trash, I figure it's fair game. That's the one disadvantage of living way out in the country --- no bags of leaves nearby! 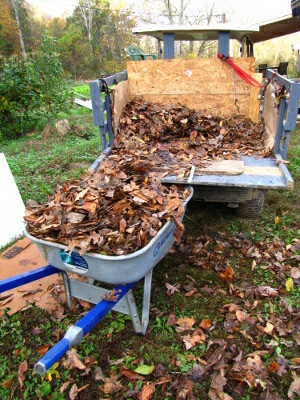 I was reluctant to use leaves as bedding because a writer said they weren't absorbent and matted easily. Have these been too much of a problem for you? Faith --- They're my favorite bedding for chickens. I can't speak to how well they'd do with other types of livestock that have wetter manure, but leaves are just the right size and shape for chickens to mix around, which results in bedding lasting longer and not matting. Of course, bird excrement doesn't include urine, so absorbency isn't as much of an issue. Well chickens dont really "pee", but the chicken pooh does contain their nitrogenous waste- its the white part of the poop. Mammals convert nitrogen to urea, but since chickens, and all birds, don't have a bladder, it ges changed to uric acid, and excreted along with their other solid waste. There are very few leaves here- the only deciduous tree being aspen . I went out in the forest yesterday and raked up two big bags of it for bedding for the hens. I need more. I wonder what the forest rangers would say if they saw me raking the woods! Leaves are much nicer than pine needles! Deb --- Yep, you definitely get the high nitrogen component in chicken manure, but the lack of actual liquid urine makes the droppings very dry. I think your aspen leaves will be top-notch bedding --- a log like maple, which is my favorite. Mark and I were just talking over dinner about how hard it would be to live in an area without lots of trees. I use their biomass for so many things --- potting soil, hugelkultur amendments, mulch, wood stove food, etc. I'm glad you found a few leaves.